The Tata LPK 2523 a high deck dipper. It is powered by a BS IV emission compliant Cummins ISBe 5.9 230 40 engine that delivers 170 kW power@2500 rpm and 850 Nm torque @1500 RPM. The vehicle has a wheelbase option of 3880 mm and a GVW of 25,000 kg. The engine capacity is 5883 cc. The G1150 gearbox offers best in-class driveability, making for easy driving. A single plate dry friction clutch, a manual 9-speed gearbox, and a fuel capacity of maximum 300 L make this truck a great choice for those looking for a power packed combination of performance, productivity, and easy driving. An excellent power steering and a 48% gradeability make for easy and convenient driving. 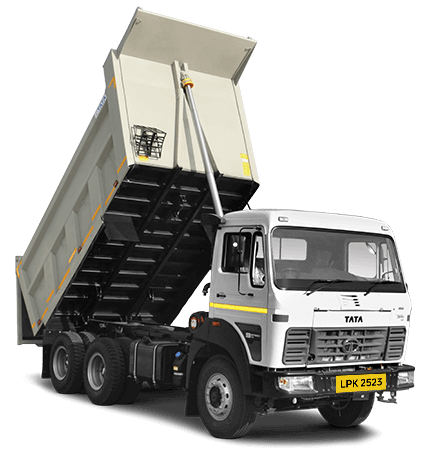 The Tata LPK 2523 is an ideal option for industries that require transporting loads like coal, stone, gravel, sand, and concrete.